St. Louis Metro works hard to help others live a green lifestyle by parking their cars and taking transit, and at the same time, we also work hard to promote green living within our agency. 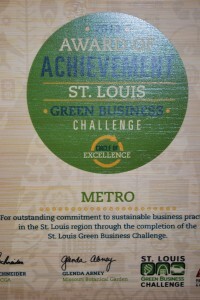 Metro was honored at the 2012 St. Louis Green Business Challenge breakfast and awards ceremony yesterday. The St. Louis Green Business Challenge inspires companies to form green teams and implement strategies to reduce energy and waste, expand sustainability programs and reduce that company’s environmental impact. The Challenge requires participants to complete sustainability strategies from a scorecard that contains categories of outreach, energy reduction, indoor environmental quality, waste reduction, and clean transportation options. Metro earned enough points to be honored in the Circle of Excellence, which means that we earned at least 150 points. 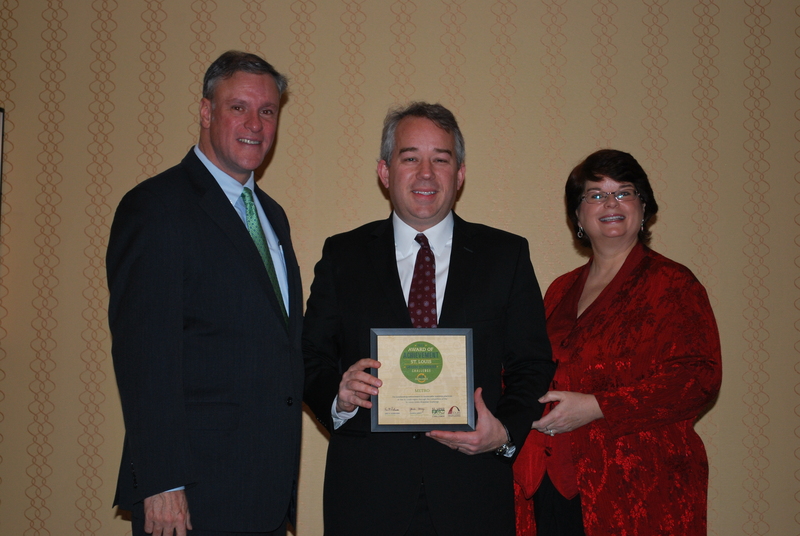 Metro’s Senior Vice President Engineering & New Systems Development Chris Poehler accepted the award. 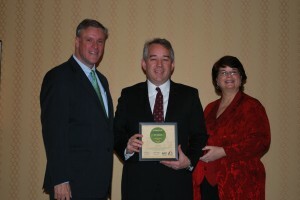 This year Metro accomplished several things toward making our company more green. Just to name a few: Metro removed all disposable kitchenware and encouraged employees to wash and reuse, and we implemented electronic document control policies that significantly reduced paper usage, and decreased lighting energy by 10%. This past year, Metro also reduced our landfill waste by 20 percent. The greatest impact we make is in providing the region with public transit, decreasing the eco-footprint of St. Louis residents and visitors, taking cars off the road, and keeping the air clean. Metro ranks among best in the nation for performance and efficiency. Taxpayers and Metro spend the lowest amounts per passenger among 10 peer cities. We’re doing our part in transporting people efficiently. We welcome the community to come aboard. 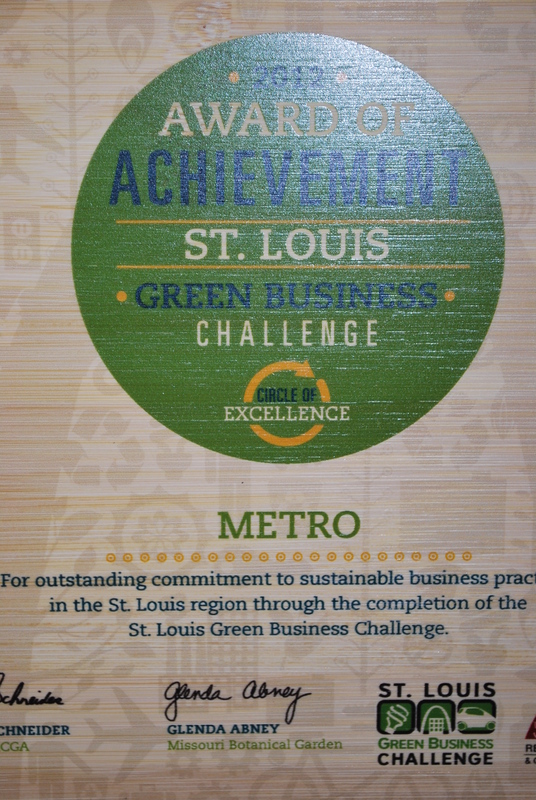 St. Louis Metro is proud to promote and practice green habits! How do you go green? Share in the comments below!